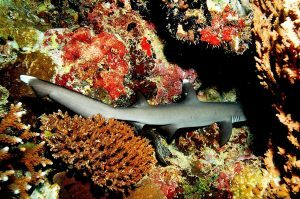 Species Profile: The Whitetip Reef Shark - We Love Sharks! Species Profile: The Whitetip Reef Shark - We Love Sharks! Though the Whitetip Reef Shark is popular for stealing fish, it can stay without food for up to six weeks. The Whitetip Reef Shark is a relatively small-sized requiem shark in the Carcharhinidae family, and the only member of its genus. It has a slender and very flexible gray/brown body, short but broad head, tubular skin flaps beside its nostrils, and oval eyes with vertical pupils. Also it owes its common name partly to its white-tipped dorsal and caudal fins. The whitetip shark is one of the most common sharks native to Indo-Pacific coral reefs. But it also occurs as far as South Africa and Central America. They’ll spend most of their day resting inside caves but come out to hunt at night. Interestingly, this requiem species can remain still while breathing unlike others in this group that must keep moving to breathe. This species is not territorial at all and often lives peacefully with other shark species. In addition, they rarely move or migrate and can remain in the same cave for years. The whitetip reef shark is a species not known for aggression towards humans, although they may come close to swimmers out of curiosity. This shark is targeted by humans for its meat. The IUCN lists it as Near Threatened. Males can live up to 14 years and females 19 years. Though some individuals could live as long as 25 years. Rarely will an adult whitetip grow longer than 1.6 meters (5.2 feet). The maximum reported specimen may have measured 2.1 meters (6.9 feet), though that report is unconfirmed. 18.3 kg (40 lbs.) at the most. This a shallow and slow swimmer that is known for swimming in a wavy pattern. Whitetip sharks hardly move far and they’ll spend much of their day motionless on the sea bottom side by side or stacked in piles on one another. The white tip reef shark is seldom aggressive to humans unless provoked. Rather, they are curious and will fearlessly approach swimmers and divers. However, spear fishers are advised to be cautious because they may get bitten when a whitetip tries to steal their catch. In fact, several reports of “attacks” happened this way. This is another intelligent animal and in some regions, whitetips will rush to the scene if they hear the sound of a speargun discharge or a boat dropping anchor. They do this because they associate the sound with availability of catch. This shark is targeted by humans for its meat but consumption of its meat is linked to ciguatera food poisoning. Major predators of the whitetip reef shark include humans, Tiger Sharks (Galeocerdo Cuvier), Galapagos sharks (Carcharhinus galapagensis), and possibly giant groupers (Epinephelus lanceolatus). The International Shark Attack File records two provoked and three unprovoked attacks to whitetip reef sharks as of 2008. The whitetip reef shark is viviparous: developing embryos receive nourishment through a placental connection once they exhaust their supply of yolk. Mating is initiated by males: sometimes up to five of them will chase one female biting her fins and body in the process. Each of them will try to catch her interest until she is receptive. Gestation period is between 10 and 13 months, with a litter of up to six pups. The birthing process is particularly intriguing as the females give birth while still swimming, and making violent twists and turns of their bodies. It takes almost a full hour for each pup to emerge. Newborns measure 52 to 60 cm (20 to 24 inches) in length long and grow relatively slowly compared to other requiem sharks. A whitetip reef shark once produced a pup through asexual means in 2008 at the Nyiregyhaza Centre in Hungary. Its slender, flexible body gives it an edge over other sharks of its kind. It allows them to wriggle into narrow crevices and holes in the reef after prey other sharks can’t get at. They feed mainly on a variety of bony fishes, like eels, squirrelfish, snappers, parrotfish, and goatfish. This shark also feeds on octopus, lobsters, and crabs. The whitetip reef shark hunts mainly at night because at this time, many of their preffered prey are asleep and easier to catch. Unlike other species like the Oceanic Whitetip Shark, this species is not prone to excitement and feeding frenzies: they’ll often go up to six weeks without food. Off the coast of Hawaii, they are known to follow Hawaiian monk seals in an attempt to steal their catches. Despite the tendency to steal catch from seal and human fishers, the whitetip reef shark can survive for six weeks without eating. This species is frequently caught by fisheries operating around Pakistan, India, Sri Lanka, an Madagascar using longlines, gillnets, and trawls. When humans consume the meat, and especially the liver, of this shark there’s a very high risk of food poisoning from the ciguatera toxin. This toxin causes substantial physical and functional discomfort including gastrointestinal, neurologic and/or cardiovascular symptoms that may need urgent medical care. Populations of this shark are dropping rapidly. Largely because of unregulated fishing pressure. For instance, on the Great Barrier Reef, populations in some zones have dropped by up to 80 percent. The IUCN has assessed the whitetip reef shark as Near Threatened. 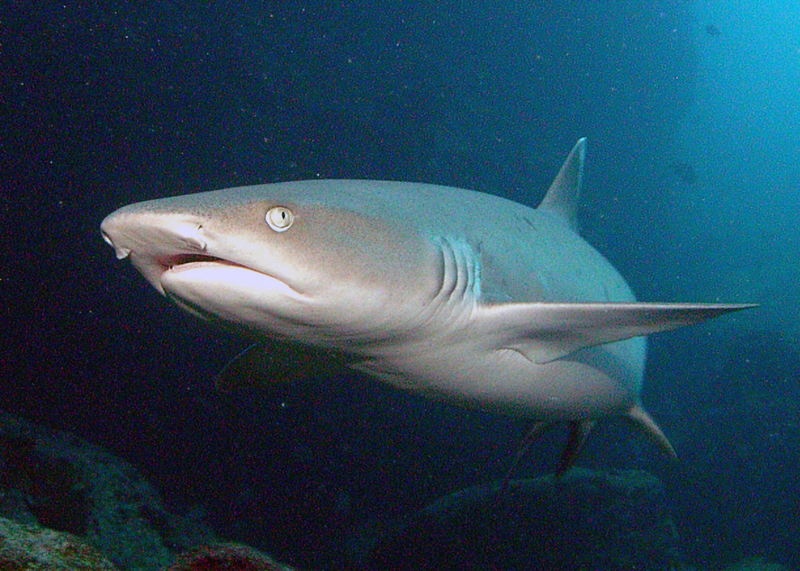 German naturalist Eduard Rüppell first described the whitetip reef shark in 1837. Its scientific name Carcharias Obesus is curious since the shark is slender and not obese at all. Sometime later also in 1837, Johannes Müller and Friedrich Henle moved this shark to its own genus Triaenodon. The name comes from the Greek triaena (meaning trident), and odon (meaning tooth). Its close relatives include the Lemon Shark (Negaprion) and the sliteye shark (Loxodon). The whitetip reef shark swims all over the Indo-Pacific region. Its kind live almost exclusively in coral reef habitats though they may be spotted resting on sandy flats, in lagoons, or near deep drop offs. More specifically, they occur around South Africa, parts of the Red Sea, Madagascar, Mauritius, the Comoros, the Seychelles, Sri Lanka, etc. Other locations are off southern China, Taiwan, the Ryukyu Islands, the Philippines, Indonesia, Hawaii, Costa Rica, Panama, and the Galápagos Islands. Their preferred depth is not too deep at about 8 to 40 meters (26 to 130 feet).